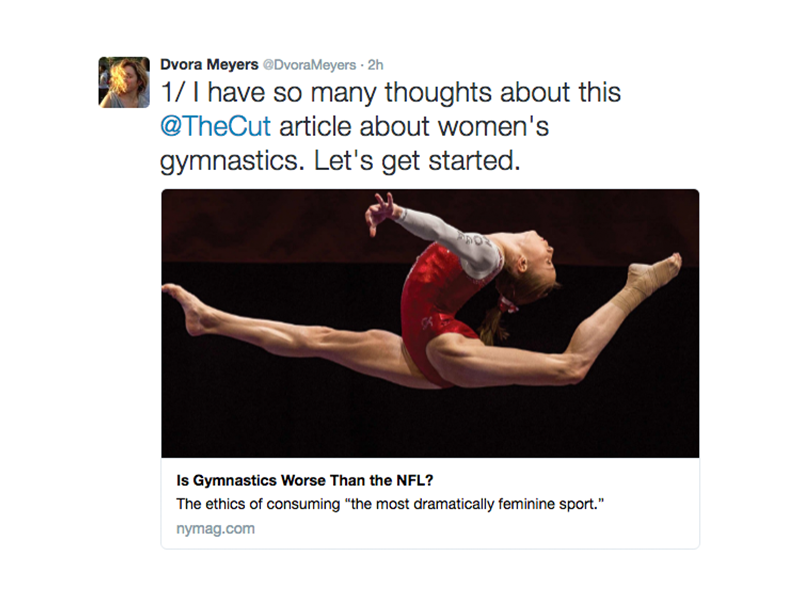 This morning, New York Magazine’s The Cut published an article with the laughably irresponsible headline: “Is Watching Gymnastics Worse Than Being an NFL Fan?” Subtitle: “The ethics of consuming “the most dramatically feminine sport.”” The author muses on feeling conflicted about the history of physical and emotional abuse in the sport, the toll the sport takes on women’s bodies, and its traditionally feminine styling. The article is littered with close-ups of gymnasts’ bodies—mainly their crotches—accompanied by their ages. Knowing how these things work, I am aware that it is entirely possible, even probable, that the author of this piece did not write the headline nor choose the photos. But whether or not the author is at fault for those particular problems, the article itself raises concerns. Enter Dvora Meyers, journalist and author of the just-released End of the Perfect 10: The Making and Breaking of Gymnastic’s Top Score—From Nadia to Now. She took to Twitter to express her frustration with the article—and she did not hold back. 3/ Football’s head injuries are by design of the game. (Tackling anyone?) Head injuries in gym are uncommon and are not by design. 4/ As far as I know, gymnastics, unlike the NFL, hasn’t been engaged in a massive coverup about head injuries either. 5/Moving onto the the story. First of all, to call gymnastics the most feminine sport, as the writer does, is to ignore FIGURE SKATING. 6/Nothing against skating. I love it. But to call gymnastics, esp. the modern version, the most feminine is grossly inaccurate. 7/As far as I can tell there’s no new reporting in this story. It’s just the old stuff, recycled with the writer’s feelings attached. 8/And guys, she’s really worried about Madison Kocian. That little girl, er, 19 yo woman. 10/What’s so bad about a little glitter and ribbons with your extreme feats of athleticism? Why can’t the coexist? Why does she disapprove? 11/Is this not the Zooey Deschanel era of feminism where women can wear girly dresses and have careers? 13/Does she not think these gymnasts possess any agency, even if they use that agency to push themselves too hard? 15/Do we really want to return, rhetorically at least, to a time when people felt women weren’t built for sports. 16/As for the toll it takes on bodies–I can’t think of any elite level sport that doesn’t take a toll on athletes’ bodies. 17/To deal with that, we have to consistently improve training methods. In women’s gym, certain skills (roll out tumbling) are not allowed. 21/What I find troubling about these stories is that no one asks the gymnasts what they think. Believe it or not–they do have thoughts. 22/While their perspectives on their youthful actions might change, that doesn’t mean they can’t act at 19 with what they know at 19. 23/The impulse to protect is a good one. But we have to be careful that we leave room for female agency. Even if the women are just 17. 24/What about men? Men’s gym is just as dangerous, if not more, than women’s. Orozco started getting seriously injured as a teen. 25/His many comebacks from injuries were seen as a testament to his grit and spirit. They were lauded. He wasn’t treated like a child. 26/Are we then morally implicated in watching men’s gym too? Or is it because the men don’t wear glitters and ribbons? 28/Side note: The coffee shop where I’m tweeting furiously just started playing part of Simone’s floor ex music. It’s her blessing! 29/I’m not going to post the crotch shots but there are a few. In so many of these pics, the gymnasts’ faces aren’t visible. 30/In conclusion, let’s always work to greater athlete safety. But let’s accept women’s agency, which also means accepting some risk. So apparently the whole time I was writing this twitter essay, my bra was showing in a big way in public. Too much “femininity”? Weigh in gymnastics fans: where do you stand?